Efforts to round up more of the wild boar which were set loose from a north Devon farm are continuing. Police believe animal rights activists may have cut the chain link fence enclosing the 100 animals at the Woodland Wild Boar Farm in West Anstey. Four have been recovered, but residents said the boar, which are not thought to be dangerous, have caused havoc digging up gardens and terrorising pets. The local council said it can kill the animals because of licensing problems. Christine Pennells, who runs the Jubilee Inn near West Anstey, told BBC News damage caused by the boars had upset her. She said: "There were five of them in the garden. They were still there five hours later, just digging up the whole garden. "The council have been taking photos of the damage because it was a lovely lawn and they were just digging and digging and digging." 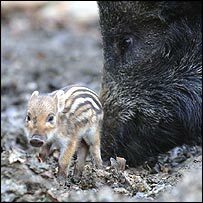 Alan Dedames, who owns the Woodland Wild Boar Farm, said it would be difficult to find all the missing animals and it had happened at the wrong time of year. "There are lots of berries, lots of nuts and fungi around at the moment. It's a Garden of Eden for them out there," he said. Mr Dedames has been warned that the local council can kill the animals. North Devon District Council said this was because the farm's licence to keep wild animals did not actually start until 1 January. It said that in the meantime it had "the power to seize, retain or destroy or otherwise dispose of all dangerous animals as it sees fit". The council also has the power to charge any costs to the firm. Police have issued a number for people to call if they spot any boar: 08452 777 444.